Recently ffmpeg added encoding support for X-Face. An x-face image is a square image, 48 pixels high and 48 pixels wide, and only composed of black and white values. A 2,304 pixel image can not contain much detail but the image was intended to accompany an email as a tiny visual depiction of the sender. Here’s a gallery of jpegs created from xface data to give an idea of what x-faces looked like. Take a video called input.mp4 and export xface bitmap files, one per frame. Export the audio from the input.mp4 file. Reading the xfaces with the audio to make a video file (probably better ways to do this). I then had a file that showed what xface looks like in video form, but if I increased the size of the video from 48×48 in my QuickTime player then the video would blur and deteriorate at larger sizes. 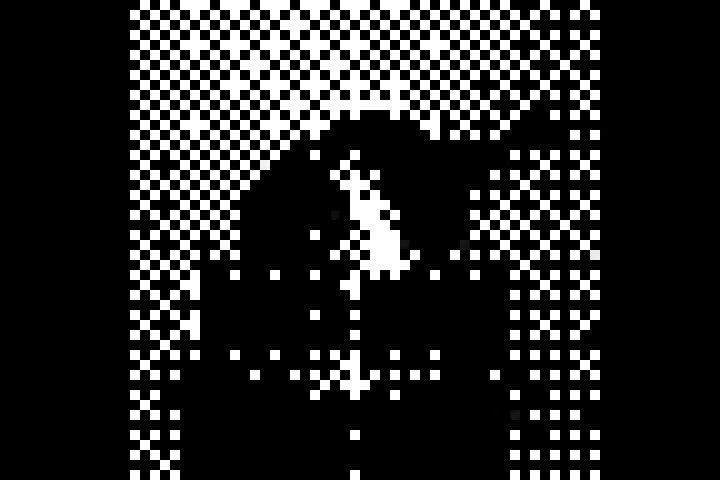 The xface image is a crisp 48×48 pixels but when scaled up to 480×480 for easier viewing the black and white pixels became rounded and fuzzy. Scaling raster images from one size to another can be tremendously lossy and in this example I really noticed the effect of my xface pixel art turning to mush as I increase the width and height. Finding a fix led me to ffmpeg’s documentation on scaling video. From here I could scale my images with the neighbor+full_chroma_inp option which preserves the blocky look at the small pixels while scaling it to a larger size. Once I figured out this process I searched for a video that would still visually represent its content even at 48×48 frame size. This was a lot harder that I would have assumed and most of the video ended up as indecipherable black and white blocks. Eventually I found a Sanka coffee commercial that seemed to work. The first 10 seconds are hard to make out but the movements of the spoon, coffee cup, and coffee pitcher are all identifiable. So if you’ve ever wondered what xface video might look like, here’s a sample. This entry was posted in derived and tagged ffmpeg, video, xface on February 8, 2013 by dave.